Contract manufacturing for OEM heater, sensor and system integration design. Design and co-developed temperature sensitive process equipment for solar, fuel cells, and other bio-fuels. Industrial applications in facilities management of liquid and gaseous chemistries. Includes mechanical design and builds and electronic controls system. AS9100 compliant and certified for commercial and personal aircraft applications. Manufacture equipment and sensors used in the monitoring of bodily fluid conditioning. 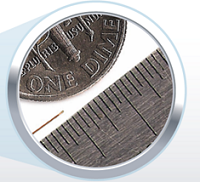 Our Microbead Thermocouple used in microsurgery applications. Production RTDs and Thermistors used in temperature feedback and management electronics. Automated controls and data acquisition systems for establishing process recipes and anticipating glo-rod decay and preventive maintenance schedules. Heaters, sensors and control systems for maintaining and monitoring chemical baths and isolated environments requiring critical temperature and RH parameters. Therm-x Thermesthesiometer Probes built in accordance to NBS TN-816, “Engineering and Construction Manual for an Instrument to Make Burn Hazard Measurement in Consumer Products” (Marzett a 1974). A fine wire thermocouple for contact temperature measurement is precisely placed on the probe to simulate human touch. Probe body temperature is controlled with a temperature controller. 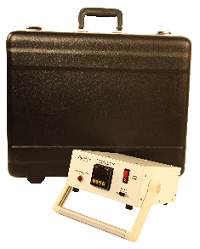 Temperature controller maintains human body temperature using a secondary thermocouple. 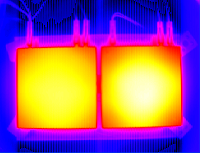 For the advanced heating application that requires temperature uniformity at higher operating temperatures than traditional heaters, PyrAlloy® is a hyper conductive composite of (1500 watts/m-K) thermally annealed graphite that is fused inside of a heater plate with the heater element to produce a uniform temperature distribution on the surface of a heater plate. Therm-x world class manufacturing and quality systems combined with extensive knowledge of temperature sensors, makes Therm-x the best solution for these types of complex temperature measurement specifications devices.